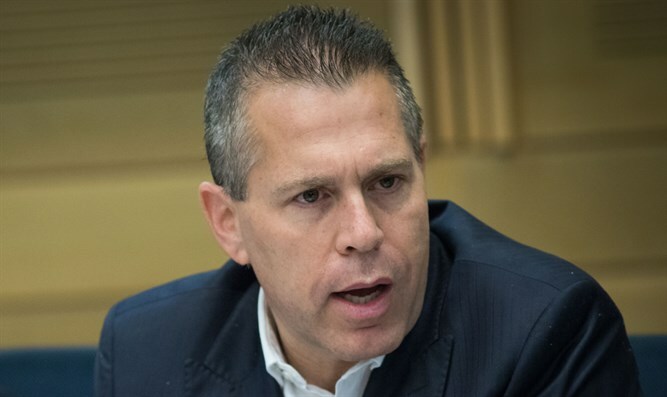 Internal Security Minister Erdan says Lara Elqasem is a prominent BDS activist. Strategic Affairs and Internal Security Minister Gilad Erdan said Friday that Lara Elqasem is a prominent BDS activist, and that the Left has been spreading lies regarding the decision to deport her. Alqasem reeived a student visa but was then charged with supporting the boycotting of Israel – and will therefore be legally deported, he insisted. "The false tweets by the Meretz party and the radical Left regarding Lara Elqasem have prompted me to put the facts in order," said Erdan. "We are talking about a foreign boycott activist, who used to head a branch of the BDS movement that uses violence to silence Israel supporters on US campuses. According to law, her entry into Israel must be blocked, and the appeals court that heard the case has approved this." "No sane country would allow the entry of foreigners who arrive with the intent of harming its citizens in any way. Israel is no exception," he added. "Belittling the campaigns that Lara and her organization took part in does not change the truth. This is a BDS activist who seeks to harm Israel and the companies that operate within it, and provide thousands of citizens with their livelihoods." "The Strategic Affairs Ministry will continue to implement a policy of shifting from defense to offense, so that the BDS activists understand that there harming Israel and boycotting it has a price," the minister emphasized. "Everyone understands that these are hypocritical organizations that would never act to help the citizens of Syria or Iran. They are not motivated by human rights but by hatred of Israel."